I’m joined this time by Jeff Large of Happy Mitten Games and Matt Worden, the designer of Happy Mitten’s very first game – Aether Magic. We discuss Happy Mitten’s evolution from a podcast to a game company, what Matt has been up lately, and what Aether Magic is all about. Tom: Introduce yourselves and tell us a bit about you. Jeff: Hello Tom. My name is Jeff Large and I’m ⅓ of the Happy Mitten Games team. We started the company in early 2013 by producing content like our blogs and podcast (happymittengames.com/itunes). In late 2013 we signed Matt’s game and have spent the past year in development. Finally we are ready to bring it to Kickstarter. Otherwise, I was a teacher for 7 years and resigned to go full-time with my web/graphics/audio company (http://comealivecreative.com/). I’m married to my beautiful and ridiculous wife Leandra and we have 2 kids. I love to play guitar, volunteer, read, hang out with the family, board game, and more. Matt: Thanks, Tom. 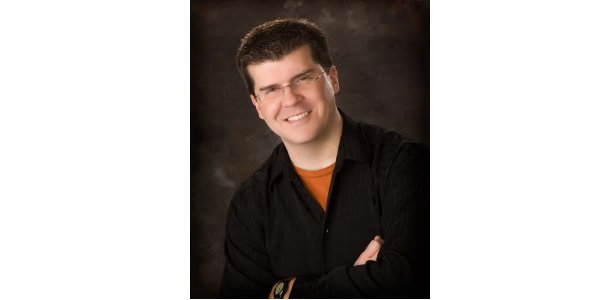 My name is Matt Worden, and I’m a pretty typical mid-40s Minnesota suburban dad, living about 30 miles west of Minneapolis with my wife and two kids. I am a business systems analyst for my real job, and have been doing computer and tabletop game design and development on the side since high school. I like to watch or play just about any sort of game or sport, and enjoy getting out in nature — camping, canoeing, fishing, etc. I’ve also coached youth sports and currently volunteer to teach religion classes for 7th-9th graders at my church. Jeff: Matt forgot to mention he’s one of the nicest guys in the industry! Tom: Wow, Matt we have things in common. I’m a fisherman too. Though I don’t get to do it very much. I used to teach kids at my former church as well. Jeff, tell us about Happy Mitten. Jeff: What specifically do you want to know? I gave you the overview in the intro. Anything you want me to focus on? Tom: Who are the other 2/3’s of Happy Mitten? Where did the name come from? Jeff: My partners are my wife Leandra and my cousin Kyle. Lee and I have been gaming for about the past 10 years- ever since our son was born. Probably 5 or 6 years ago Kyle started hanging out in our friend group more and began to game with us. All 3 of us have that “entrepreneurial spirit” and started throwing around business ideas and settled on starting a board game company. That’s how Happy Mitten was born. Matt: But, Jeff … the name … where’d that come from? Jeff: Naming things is difficult, especially a company but it will hopefully be around for a long time. We toyed around with a bunch of ideas. Most of them focused on locations Lee, Kyle, and I had in common. “Mitten” ended up being the favorite (Michigan looks like a Mitten). From there, adjectives were thrown around until “Happy” was decided. Originally I thought it was stupid but it’s grown on me. It’s light-hearted, fun, and has a positive vibe to it. Tom: Matt, you have been designing games for several years. Talk a bit about some of your games and Matt Worden Games. Matt: While I started out programming computer games, I’ve been primarily just working on tabletop games for the past 5 years. My best known titles, so far, would be Castle Danger, Jump Gate, Space Mission and Dicey Curves. I’ve focused my efforts the last couple of years on print-on-demand publishing through TheGameCrafter.com, while pitching bigger, more complex games to other publishers … which is how Aether Magic is with Happy Mitten. I formalized my games-related activities under Matt Worden Games, LLC, back in 2010, when I self-published the second edition of Jump Gate. And I am currently ramping-up to a return to traditional publishing this year with my first title in the “Tales of Danger” series of games that I recently announced. I expect to continue publishing games in a print-and-distribute model for the Land of Danger and Jump Gate product lines over the coming years, while still developing and pitching my other designs to other publishers. Question for Tom: From your experience in interviewing other small publishers in this niche gaming space … What are the best steps I can take to make sure my upcoming games get noticed? What’s the best way for me to be able to get them into FLGS’s? Tom: Matt, to answer the ‘best steps’ question, get the game in front of people and build buzz. Gamers tend to take their friends’ advice about how good a game is over some random review. Solicit reviews from the top 5 reviewers. Get the game out there. As to the FLGS question, talk to the game distributors is my only suggestion here. Or contact several of the higher profile game stores and offer them copies to try. Jeff: Tom, what do you think makes having the advice of reviews so important? It’s seems to be accepted that having “professional” reviews of your game on Kickstarter are a requirement. I wonder if it’s the reviews that are “necessary” or just evidence of social proof that you aren’t the only one who likes your game. Tom: Jeff, that is an excellent point. I don’t think having a professional reviewer say great things about your game is so fantastic. You paid them to do so in essence. But reviews by us commoners I believe holds more weight. Your comment about social proof hits the nail on the head. We don’t want to take a chance on buying a crummy game. If some other people have vetted it so much the better. What do you think Matt? Matt: I really rely on the folks I follow to share their opinions on the games they try. Mainly, this is because I don’t get to play games as often as I would like. So, they let me learn vicariously through their experiences. On the other hand, I’m pretty open-minded and like a wide range of game styles. So, the buzz itself isn’t as important to me personally — I’ll still give things that seem interesting a closer look and form my own opinion on if it’s something I’ll like. But having that buzz is a good way for me to notice in the first place. Tom: Matt, talk a little about your other games first, before we get to Aether Magic. And about your “Tales of Danger” series cause that has me very intrigued. Matt: Following closely on the heels of Happy Mitten Kickstarting Aether Magic, I expect to launch my very own first Kickstarter campaign, in April or May, for Tales of Danger #1: Days of Discovery. Yeah, it’s a mouthful … but it’ll make sense as the series progresses. There will be 7 games in the series, each covering a different period along the timeline of my alt-historical “Land of Danger.” This first game will start in Portugal in 1290, with players looking to get sponsorship and carry out a voyage to discover the fabled land to the west. The second game will focus on the settlement of villages along its coast. And so on. Along the way, you’ll find out why they called the land by this odd name and how it developed along its course that eventually has it disappearing from our history altogether. Toward the end of the year, I plan on rebooting Jump Gate in a very high-end production with all new artwork — by a real artist this time. ;-) Essentially, I want to do production-wise what Schmidt Spiele did with Space Mission, but without the simplifying rules changes. This will be the start of a full line of games set in that universe, including the 2 expansions to Jump Gate itself. And, I have a handful of other games that aren’t part of either of these lines that I expect to be showing around to other publishers as I attend events throughout the year. For example, Abbottsville — a tile-laying game set in the early-1800s on the near-west prairies (and having nothing to do with punching pumas) — showed some potential at Protospiel last summer, and my heavy strategy opus, Magistrate, is getting very close to being ready now. There’s a few more on the back burner that may bubble up to the front again along the way. Tom: I remember you talking about both Abbottsville and Magistrate. I also remember that people had very good things to say about them both. I’m glad to hear they are still being developed. I’m really interested in the Tales of Danger series. I’m a pulp fan and that name drags me right in. I like alt-history too. So you’ve sold one copy already. I can’t wait to see it. If you need playtesters…. Tom: SWEET! Please do. I would really like to see it and help you out. Now let’s talk about Aether Magic. What’s it all about? 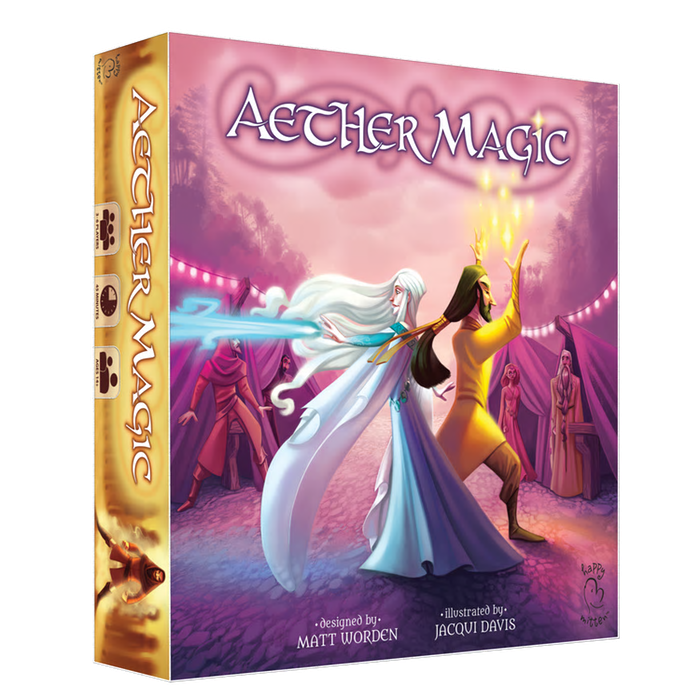 Jeff: Aether Magic is a fantasy-themed auction and set collection game. It’s for 3-6 players and plays in 45 minutes. 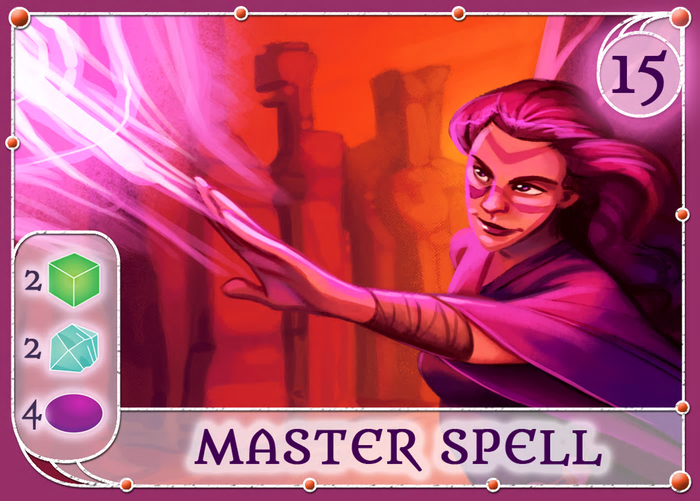 In Aether Magic, you play as a Mage summoning Aether from the Portal, you trade with other Magi for the Elements and Runes you need to cast the spectacular Spells to earn points and win the title of Master Mage. Tom: It sounds cool. What’s gameplay like? 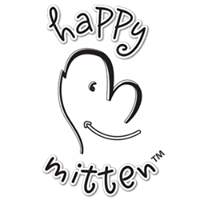 Jeff: The game has a few specific qualities that we were really looking for to represent the Happy Mitten brand. For one, it’s highly social. We really like to play games where you are interacting with the other players. Everyone is involved in the auction process each turn and we encourage table-talk to get what you need. Second, players have plenty of opportunities to feel clever. As the game progresses, you acquire more resources and have chances to chain multiple spells together based on their effects. Last, I think the game is very approachable. We’ve tested it with many people and one complement we frequently get is that it’s easy to learn. Matt, I know you really enjoy how the auction/ offering phase works differently than most games’ auction mechanic. Why don’t you comment on that and anything else I missed? Tom: I like highly social games too. I also like to feel clever since I’m not particularly so. Yeah, I’d like to hear more about that auction mechanic. Matt: The auction mechanic hangs on a couple of interconnected things. First, you are required on each turn to give something valuable away to another player. Second, each player has his/her own currency (these are the “Runes” Jeff mentioned) that is actually worth nothing to its original owner. However, if you combine 2 Runes that came from other players, they can be used as a wildcard Element when casting Spells. On your turn, you’ll be putting some Aether up for auction, while letting the other Magi know what you’d like to see offered for it. The other Magi then bid with any combination of Runes and magical Elements that they wish, and you declare one of them the winner of the auction, trading the Aether for whatever it is he/she bid. This means that the value of each bid becomes subjective and a number of different things play into your decision of who wins your auction: Is someone offering a Rune you don’t have yet? Is someone offering that one Element you need to cast the Spell you want? Is there someone you simply *won’t* let win because they already seem too powerful? Do you owe someone a favor due to an early auction result? Tom: I really am intrigued by that auction. It is very unique for a non-party game. I think it is cool that you figured out how to make it work in a strategy game. Matt, why did you choose to go with Happy Mitten for Aether Magic? Matt: I started following Happy Mitten shortly after they started their website and podcasts in 2013. I was impressed by the quality of guests they were interviewing and the information coming out of those interviews. When Jeff announced that he would be at GenCon and was going to be looking for prototypes to test, we exchanged e-mails and agreed to meet and chat in-person for a bit. I didn’t think the prototypes I had with me would be a fit for them, so I wasn’t even planning to hand off a game to him at first … I just wanted to make the contact and introduce myself. As we chatted, though, I really liked how open they were in their process and their approach of both learning from those with experience and sharing those conversations with the community via their podcast. I’m a big fan of folks stepping out and trying something new like they were doing. Jeff: Ha! At that point of the process we already went through a ton of games. When we decided to sign a designer instead of creating our own game, we did open submissions via our website. Even with filtering the process, we played many games that were unrefined or didn’t fit our style. Honestly, I’m kind of surprised Matt’s game made it to our table too! However, it was really fun. The best part was the social interaction during the auction phase. After a few more plays we started discussing what we wanted to do with the theme. Quirky may be funny but we didn’t think it’d be very marketable. After more discussion as a team and with Matt, the game was signed in Q4 of 2013. It’s been a lot of work getting to where we are now but we’re very happy with the current state of Aether Magic. Tom: Ok. You have Jaqui Davis on art. Wow! She is SO busy. How did you get her? Jeff: We asked her and she said yes. 🙂 Kyle handled reaching out to the artists so he’s a better person to ask. He discusses the process a bit on a guest blog from Boards & Barley here- http://boardsandbarley.com/2015/02/10/aether-magic-kickstarter-by-happy-mitten-games/. Tom: I really want to play this game! Matt: I think it’s important for every single human being on the planet to play it! Tom: I will do my best to make that happen. Oh, idea “Tiny Epic Aether Magic”. What do you think? Guaranteed million plus seller. Tom: HA! That’s great. Jeff, let’s spend a bit of time on your ‘day job’ – Come Alive Creative. Tell us about that. Jeff: Gladly Tom! Come Alive Creative is our full service creative shop. I’ve put together a stellar team with diverse strengths we handle web design, audio production, graphic design, branding, and more. We serve clients who are ready to improve their businesses or ideas but don’t have the time or know how. For example, we took over producing Funding the Dream last November and lately the team has been helping Happy Mitten with the graphic design for Aether Magic and most of the photography and videography for the Kickstarter. We also have a podcast, Come Alive Creator (https://comealivecreative.com/itunes), where we interview entrepreneurs and hear about their stories. In our last podcast we interviewed Jamey Stegmaier and discussed the business side of his journey. So if any of your readers need help with creating a website or graphic design for a game, they should check us out- ComeAliveCreative.com. Tom: Jamey is such an awesome guy isn’t he. CAC sounds like it could be a boon to the gaming community. I will do what I can to get you some press. Jeff: Thanks Tom! We certainly have an inside scoop being part of the gaming industry. Matt: It’s been a fun interview, Tom … thanks for having us on! Anyone interested in learning more about Aether Magic, or wanting to support Happy Mitten on their first project should definitely go checkout the Kickstarter page. Jeff: Thank you for the time. It’s been such exciting journey and we’re grateful for all of the support from everyone along the way. We’re really excited to see how the Kickstarter does. Tom: Where can people interact with you? Matt: My website (http://mwgames.com) is the hub of everything I’m working on. I also have a Facebook page (http://facebook.com/MattWordenGames) where I post pictures and share links, and I jabber away at Twitter (http://twitter.com/MattWordenGame) on a regular basis. That’s a lot of links! Thanks again! Tom: Thanks guys! That was a fantastic interview. I’m excited for you and Aether Magic. It sounds very interesting and unique. I’m happy to help promote it and you. I’ll talk to you soon. Readers, thank you once again for joining me and my guests. You can find out more about Happy Mitten and MWG at the links above. 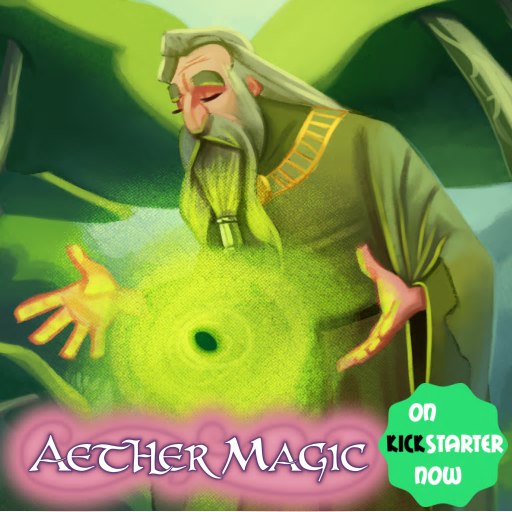 Here’s the link to the Aether Magic Kickstarter page. Please consider backing it. You will not be disappointed.